On December 4, 2015 Daphne James (nee Lamprell) passed away peacefully at St. Paul’s Hospital in Vancouver, BC. Daphne was born and raised in St. James (now part of Winnipeg, MB) prior to her marriage to Arthur James, also of Winnipeg. After short moves with the TD Bank to Pilot Mound, MB and to Vegreville, AB, they settled in Edmonton. After celebrating 50 years of marriage on May 7th, 1999 Arthur passed the following December. Daphne is survived by her loving son, Reg (Brenda) of Richmond, BC and daughter, Mary (Mike) Youssef of Calgary, BC and their son Jamil, Daphne’s much loved and only grandson; as well as two nieces, Dorothy (Michael) Stephens of Winnipeg, and Beverly (Guy) Catellier of Manitoba and their families. She was predeceased by her only brother, Peter Lamprell, in 2004. Daphne re-joined the workforce after raising the family and enjoyed her years working for Associated Engineering and then for the City of Edmonton at the old City Hall. After retiring, Daphne and Arthur spent many happy winter holidays in Hawaii - especially enjoying the flights over on Wardair! 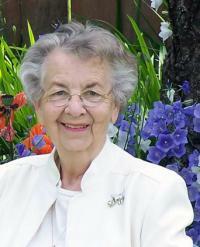 For many years Daphne was an active member of the order of the Eastern Star, Edmonton Chapter No. 19 and served on the Altar Guild and ACW of Christ Church Anglican in Edmonton. With 58 wonderful years in Edmonton, and leaving behind many dear friends, Daphne embarked on a new adventure and moved to Vancouver this past September, at the young age of 90. Living a ½ block from English Bay, she could be found any sunny day exploring the beach, her new neighbourhood and meeting new friends. Daphne will be sadly missed by the many who knew her and whose hearts she touched.